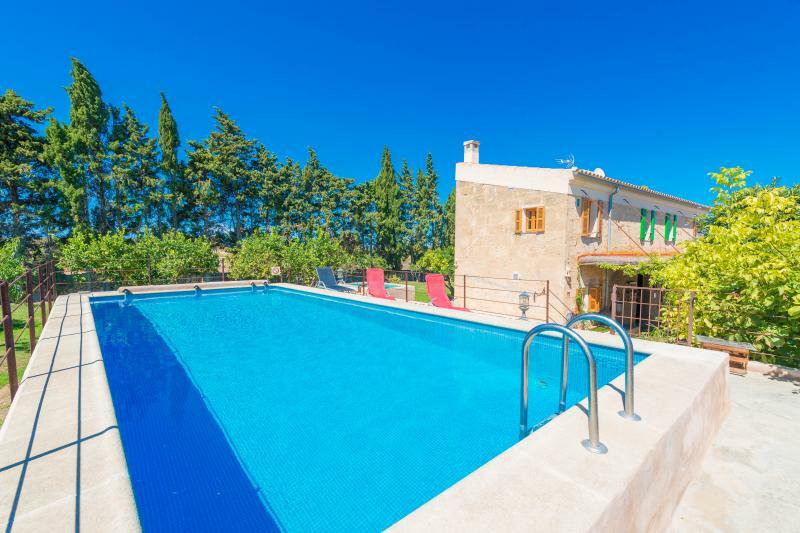 This gorgeous house is located at a quiet area at the entrance and exit of the village. 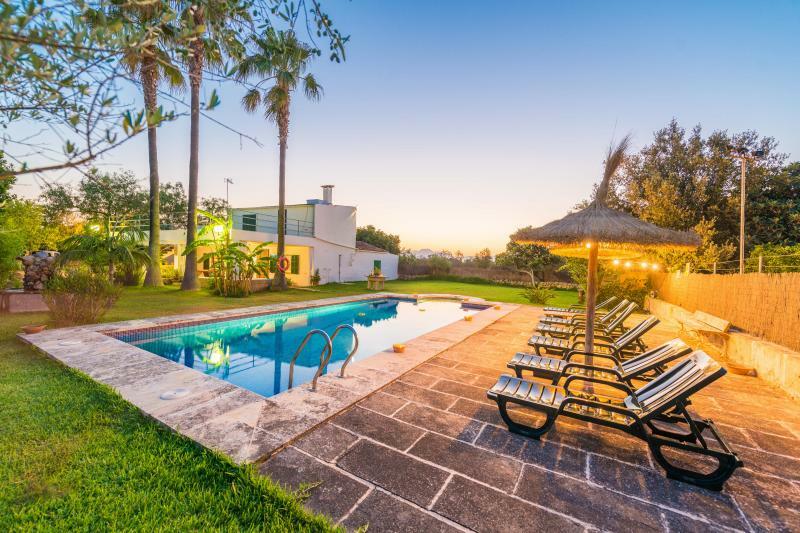 it disposes of a big courtyard with a private chlorine 3.5m x 3m swimming pool, and a 0.80m depth, and also a fantastic furnished porch with a barbecue where you can prepare a tasty meal. There are two orange trees and one lemon tree, very useful for cooking or squeeze them for a natural and healthy fresh juice. 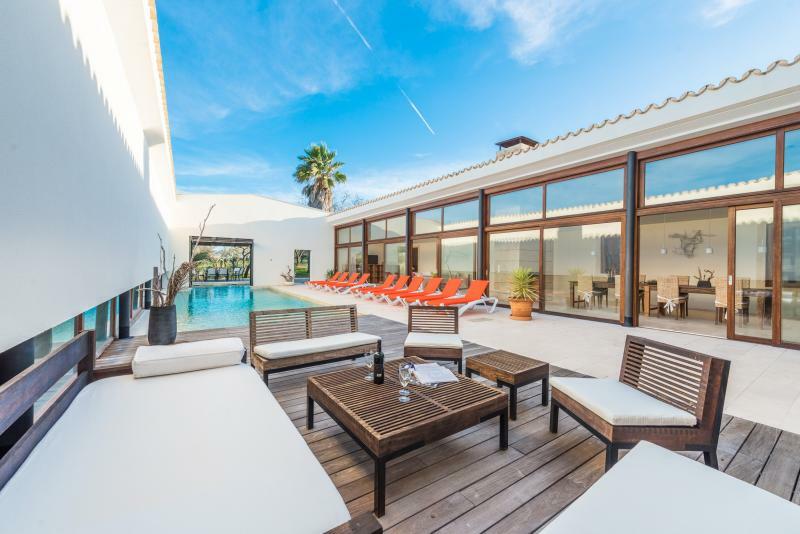 The property is divided in two floors.At the first floor, there is a comfortable dining-room with satellite TV and air conditioning, with a modern decoration mixed with the typical majorcan style, makes this space so special. A lovely kitchen with vitro hub with all the necessary amenities you might need for your stay.There is a toilet on this floor. Going up the stairs, you will find a little lounge with air conditioning and a bathroom with a bath. There are four bedrooms, three have a double bed two of them dispose of a bathroom en suite with a shower and one has direct access to a cute terrace. The other bedroom disposes of two single beds. You will find a washing machine, an iron and an iron board.if you travel with your baby, we will provide you a cot and a high chair. Santa Margalida is a village located at the center of Majorca, so it has relatively quick access to any part of the island. It is a countryside area, lived in by local people, perfect for discovering an authentic Majorca. At only 9km distance, you can find Ca"n Picafort beach, well known for its white sand and crystallized water, where you will feel like in paradise, and try the traditional restaurants where you cant miss trying a delicious typical paella by the beach! Can Picafort and Puerto de Alcúdia promenades are very lively if you are looking for a bit of entertainment. Note: This property cant accept under 28 years old guests, except if they travel with their parents. We need copies of every ID from every person to accept the reservation. Beach: 9km - Can Picafort. Sehr geräumiges Haus mit 2 großen (jeweils mit separatem Bad) und 2 kleineren Schlafzimmern. Malerische und unglaublich ruhige Lage am Rande von Santa Margalida. Das Haus hat unsere Erwartungen deutlich übertroffen und bietet sowohl im Haus als auch im Hof eher mehr Platz als die Fotos hier versprechen. Wir waren mit 8 Personen hier (davon 3 Kinder) und haben hier wirklich einen großartigen Urlaub verlebt. Übrigens ist Parken auch direkt vor dem Haus möglich - am besten dann die Seitenspiegel einklappen um Gästen des danebenliegenden Ferienhauses auch einen Zugang zu ermöglichen.